It’s been almost 2 months since Dreamforce 16 took place, and I have not yet written a blog post about my experience there. I spoke with many vendors and got some ideas for new uses of Salesforce. This question sparked in my brain a torrent of thoughts and memories. You see for me, my Dreamforce 16 experience started months before October 2016 and was heavily influenced by Twitter and those people I have connected with. You might say my DF16 journey started in July 17 2015, with a change in my career. I knew I wanted to continue my work in Salesforce (SFDC user/admin since 2009). On this date, I began studying for my Admin Certifications and dove into Trailhead in a serious, habitual way. That was a big day. You might say that my path to Dreamforce started on November 13th, 2015 when I volunteered at my local Salesforce User Group and I got to meet @TheChrisDuarte who was so supportive of me as a person and my journey. 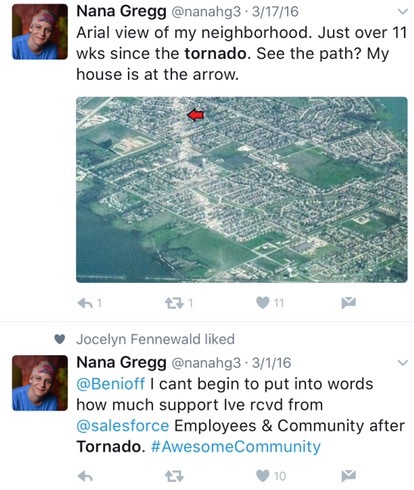 Leyna spread the news about the tornado that hit Nana Gregg’s home and asked the community to reach out to help with financial and emotional support. That was the day that my understanding of #Ohana began. I saw the outpouring of support from Admins and Developers. Nerds, Geeks, Technologists, Marketers, and even Salespeople reaching out to offer Nana support, prayers, time and love. It was heartwarming to me. 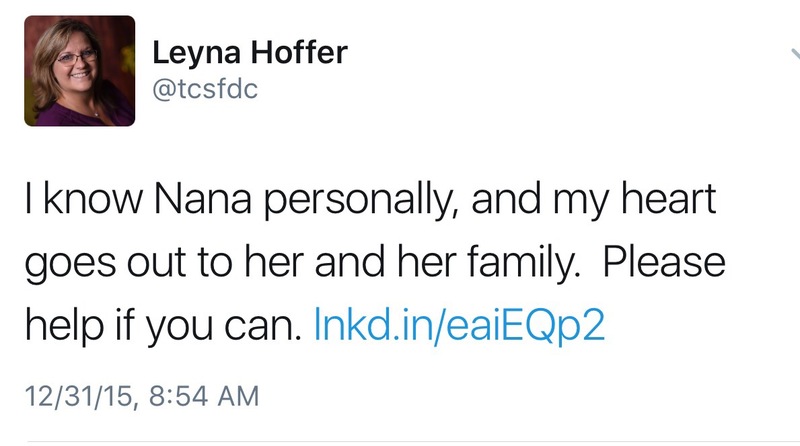 Through Nana, I found other connections to the Salesforce Community. 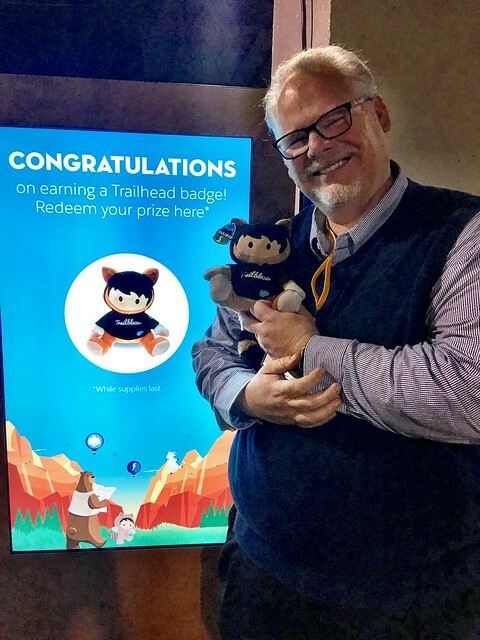 What I have learned through these connections is that the Community is more than just a group of people who want to learn about Salesforce, and more than just about solving issues and offering advice for formula fields and validation rules. The Salesforce Community also cares about YOUR well being, they want you to succeed not only with the technology but with your life. Because of people like Nana Gregg, I signed up for Midwest Dreamin, where I got to MEET these HEROES in person. I had been following people like Nana from afar, through the Salesforce Community and through social media. I had been awestruck by their knowledge about Salesforce, ability to offer answers to tough questions, and ability to guide other admins and developers around the world. I was pinching myself at Midwest Dreamin because here were people I had been admiring and following who treated me as if we had known each other for years. The quality of the people in this community is amazing. It is the #Ohana. The first person I saw at Dreamforce, in the Hilton lobby on my way to the registration desk, was none other than Nana Gregg. I was so delighted because for me – that meant that DF16 had started. I got to say hello to one of my favorite people in the community, and I knew that meant that I would be seeing more of my #Ohana! At Dreamforce I got to participate in the NerdforceCon, an event put on by Salesforce Community members to raise money for kids in need. It fit right in with the #Ohana of this community giving back to others. My Dreamforce 16 experience ended at the Marc Benioff Q&A, (where I had “that amazing experience” which I may write about later). I was seated (randomly?) in the front row right across from the Salesforce VIPs (Executive Level folks). So, who sat by me at the session? None other than Nana Gregg! At the event, I was looking around at the MVPs, User Group Leaders, Salesforce Employees, and other Gurus and started to have #ImposterSyndrome. “Why am I here?”, “Am I supposed to be here?” I was getting somewhat concerned that I was not meant to be.